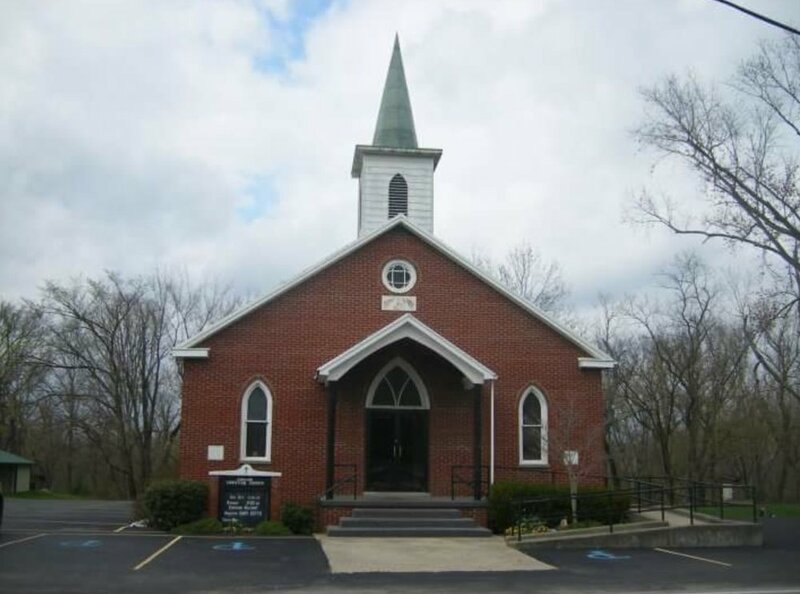 The Mill Creek Christian Church, located on East Prong Mill Creek, was organized and built in 1890 with Elder R. A. Burris presiding. 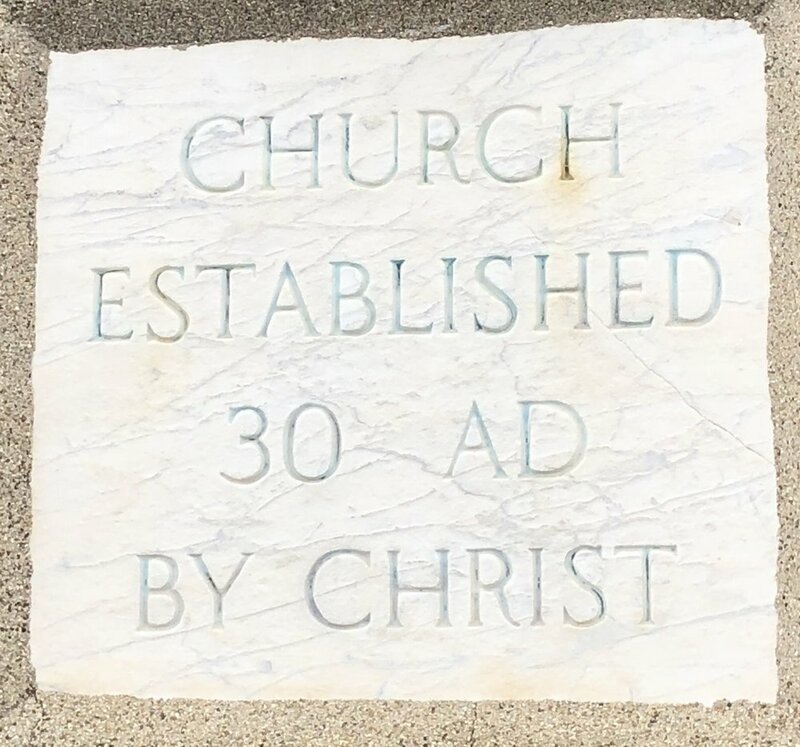 The church was dedicated the last Sunday in October of 1890. The house was a beautiful structure, costing about $1600, the audience room being 36' X 50', with a 10-foot vestibule and a tower. The ceiling was arched and finished in hardwood. The floor was nicely carpeted, the seats comfortable, while a beautiful lamp hung over the night stand which served as a pulpit. Between the years 1890 and 1894 English became a growing community. With the younger generation moving to town and the rising waters of Mill Creek entering the church during heavy rain, it was then decided to move the congregation to the English Community. In 1890 the Trustees of the Mill Creek Christian Church, B. T. Robertson and William Cochran, purchased land in the English community from Norvin and Martha Green for $1.00. The deed was recorded March 22, 1892, in Deed Book 21, page 205 in the County Clerk's Office. In 1895 the Mill Creek Christian Church was torn down, hauled to English where some of it was sold to the Worthville Christian Church for $25.00. LaFayette Hartman, father of the late Mrs. Lizzie H. Jones constructed the building with all new lumber and with local help. The new church building was apparently completed by Christmas 1895, with the young people of the congregation presenting a Christmas Program. Mrs. Presley Tharp was the first janitress and Mr. Tharp was the minister at the time. Names of some of the early officers were: William Cochran (he was also the first Sunday School Superintendent), William Hayden, Ben Wilson, B. W. Wright, Lyman Guinn and Ben Thomas Robertson. The building was then remodeled in the 1920's by having a high arch and a ceiling lowered and "electric lights" installed. A new set of seats had previously been bought when Bro. Greenwill was minister. Two coal stoves warmed the large building. As time went by it was decided by the congregation it was time to expand. Plans were made for a new building with Sunday School rooms, a kitchen, etc. on July 6, 1959, the tearing down process began. Tom Mefford, minister, was quite instrumental in initiating plans for raising funds to start the new building program. Mr. Walter Brown, an elder of the church and a builder by trade, drew the floor plans for the new church. Members and non-members were making pledges of quilts and sold them, held bake sales and hosted dinners for a fee. During Thanksgiving time, on a rainy night, the women prepared a banquet supper. Price per plate was $3.50 but additional donations were being accepted. On that night at least two (2) plates were purchased at $50.00 each. The young people made crafts and sold them also. Construction progressed from the foundation to the walls. Salvaged wood from the old church building was used. Used flooring from a Louisville Scrap yard was used for the walls and rock wool was used for insulation. The men and women continued to work diligently handing up lumber or did any job that was required of them. Dr. Baldwin gave the doors out of his house to be used for the Sunday School rooms. The pews came from a cemetery chapel in Rushville, Indiana. The chapel was torn down and the pews were going to be discarded so the church decided to purchase the pews and refinish them. The front doors were given to the church by the Louisville Wrecking Company. The windows from the old church are the same windows we have in our church today. While construction was on-going, church services were held in the old English Schoolhouse auditorium. The first service in the new building was held Easter Sunday, April 17, 1960. During the summer of 1960, Al Richardson loaned out his farm and his barn to Joy Bells. These girls had such a good time it became the beginning of Happy Hills Christian Camp. The camp program has been growing strong for the last 40+ years and the future looks bright. In 2015, the church decided to relocate in Carrollton for similar reason's as in the 1890's, to go where an even greater opportunity to spread the gospel is needed in the Carroll County area as well as much needed space and parking as the church has significantly grown. Property was purchased in May 2016 and finalized in August 2016. Demolition of the Save-A-Lot's interior began in January 2017, and construction phase started in May 2017, A great portion of the project has been done by members and friends of ECC. At the present time, our first worship service at the new Carrollton campus was August 5, 2018. We look forward to the coming years! Our church has been blessed to have many diligent workers throughout the years. We pray all of our efforts prove to add to God's "FOREVER FAMILY."